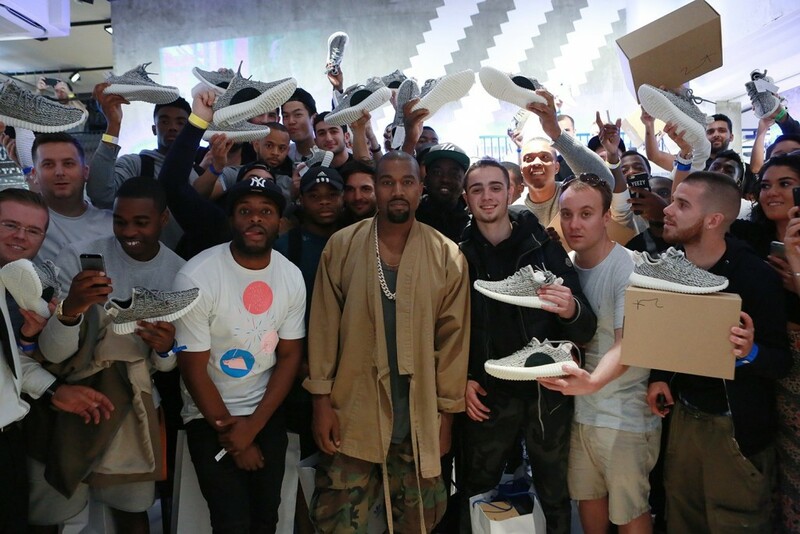 Treat your Feet: Are Yeezy’s Worth the Hype? It’s been a long journey for rapper turned fashion designer Kanye West. After 10 years, and over thirty different sneakers designed, Mr. West has reached a new height as both a designer and as a disciple for the people. However, the Chicago native is far from your average designer. Even though he spumes confidence and has countlessly been quoted saying that he is the most influential figure within fashion and footwear, what makes Kanye’s inception into fashion so interesting is that he isn’t a celebrity athlete, but rather a rapper with an act for creating. Luckily, for Mr. West, after a decade of soul searching and countless closed doors, he has finally found “the infrastructure” to bring to light some of his wildest dreams that previously couldn’t be accomplished. From his most recent partnership with the sneaker heavyweight adidas and his Yeezy Season line to previous partnerships with the likes of Nike, Louis Vuitton, and many more, it’s safe to say that Kanye West may be the most influential name in footwear right now. Of course, any sneaker marked with Kanye West’s name is bound to generate raffles, strife, and commotion. But even though the Kanye brand has monetary value all on it’s own, that doesn’t mean that his Yeezy sneakers stack up to his immense career or do they? For this episode of ‘Treat Your Feet’ we dive into the world of Kanye West to look at all the sneakers the iconic designer has made in order to find out if Yeezys are really worth the hype. Let us find out. If you’re a real Kanye fan that has been following him since his early days, then the Dropout Bear is a piece of nostalgia. It was only fitting that Kanye would adorn one of his first ever shoe designs with his iconic trademark. 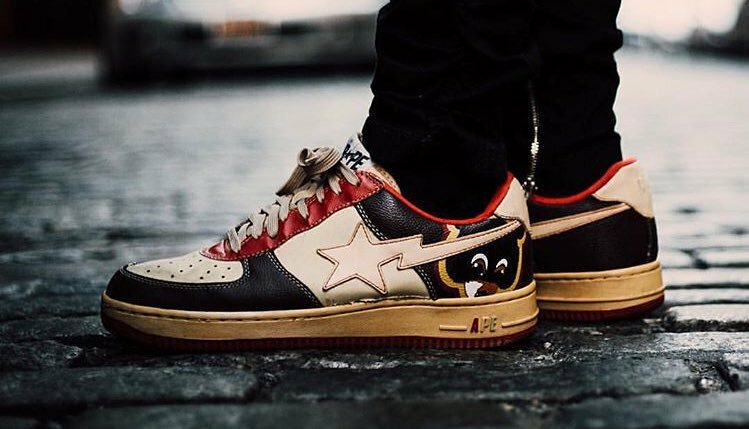 After a few months of planning, the hungry designer and the Japanese based streetwear brand Bape finally teamed up to design a special edition release of the brand’s signature Bapesta model that evidently released in 2007. The shoe was crafted with an upper that sported many different shades of brown juxtaposed with some contrasting orange for that added hint of pop. 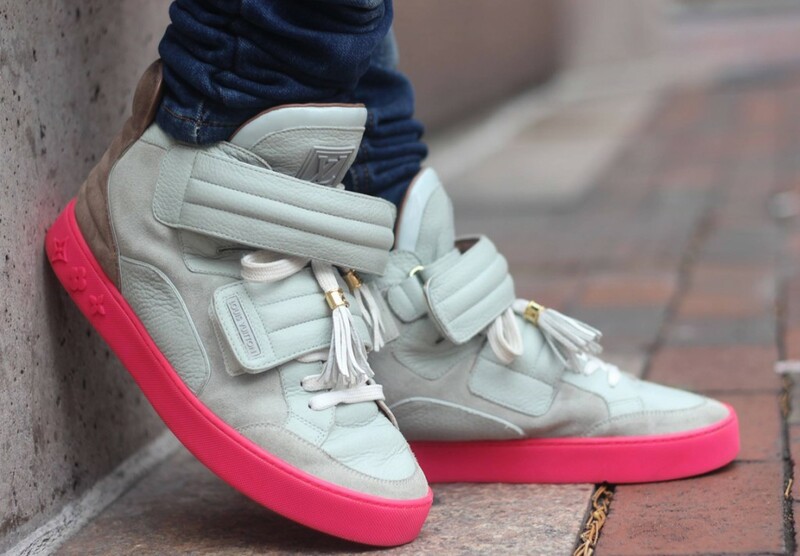 In typical Kanye fashion these shoes were released in limited quantities and sold out almost immediately. Don’t feel bad if you haven’t been able to get your hands on a pair of Yeezys’ – it’s been hard since 2007. And while these are not “Yeezys” to say the least, owning a pair of the highly coveted Bape x Kanye West collab is nothing but a sneakerhead’s dream. It’s safe to say the ‘Dropout Bear’ sneakers are worth the hype. It seems like every rapper at some point in their career has rapped about Louis Vuitton and Kanye is no different. In fact, in 2009 Mr. West was then known as the Louis Vuitton Don. So, it was only fitting that the recording artist would next team up with the luxury brand to create three sneaker silhouettes. What’s interesting about these shoes is that Kanye named the shoes after people whom were close in his entourage: Ibn Jasper, Mr. Hudson, and Don C.
While each shoe retailed between $840-$1,1400 USD, each pair had it’s own appeal. But none had a greater following than the Jasper. Offered in three colorways: Cream, Patchwork, and Black, the Jasper was the critics’ favorite due to its unique look. Each edition of the Jasper silhouette hosted premium materials such as suede and fine leather along with two straps. In fact, this is the first time we begin to see the placement of the strap that can be spotted on almost every pair of shoes created by Ye till this day. The ‘Don’ and the ‘Mr. Hudson’ on the other hand were “safer” options for those whom didn’t appreciate the avant-garde design of the ‘Jasper’. The Louis Vuitton Don silhouette removed the straps and brought along some tassels on the end of its laces for a bit of complexity. Louis Vuitton’s Mr. Hudson, named after his music collaborator, resembled the Don C. closely, but kept things simpler with shorter laces and an upper that resembled a pair of boat shoes. There is no doubt in anyone’s mind that the Louis Vuitton’s, especially the Jasper silhouette, are worth the hype. 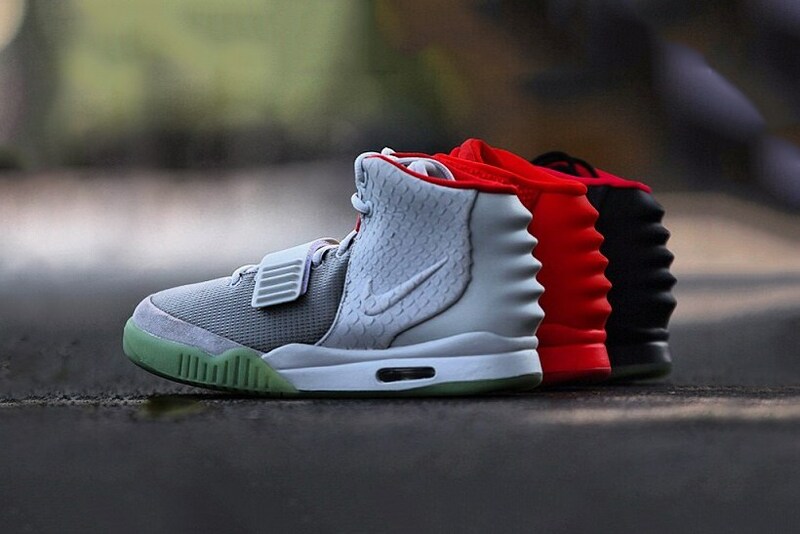 Finally we bring you the shoe that gave us the “Yeezy” name: the Nike Air Yeezy I. Most arguably this is the shoe that changed the game and the hype. I’m not going to lie. I was not a fan when I first saw this shoe and let’s face it, most people weren’t either. It took time for them to grow on devoted Kanye fans. While some loved them at first sight, a lot of us had to adjust to the new look of modern day footwear. Originally released in a trio of colorways: Zen Grey, Blink and Net, each pair was a whopping $215 USD. Today, you’ll be lucky to find them for anything less than $1,000 USD. I mean would you think any less from the original pair of Yeezys? While the design, may not be everyone’s favorite, we can’t deny the influence this sneaker has had. This is why this shoe is worth the hype. I mean it’s the original Yeezy. Arguably everyone’s favorite pair of Yeezys to ever release is the Nike Air Yeezy II; it was the most anticipated shoe of its day. 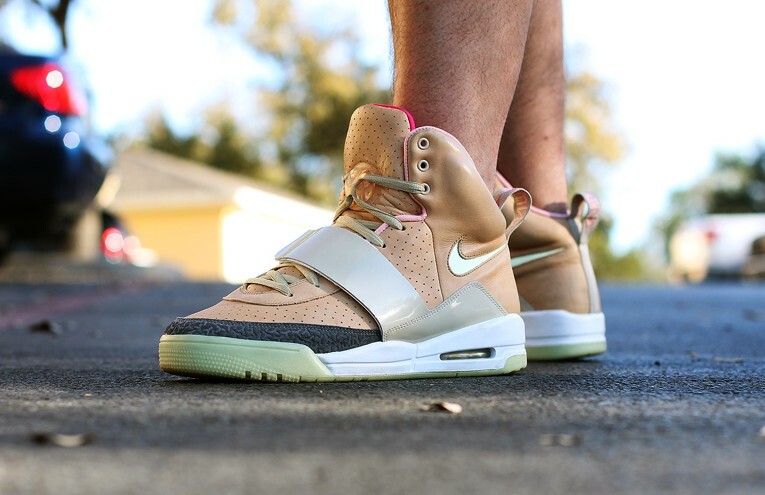 The sequel to the Nike Air Yeezy I, changed the game, being both a hybrid for both casual and athletic wear. In fact, these shoes were worn by NBA players (e.g. Nick Young) and by starlets alike. The Nike Air Yeezy II was inspired both by its predecessor the Nike Air Yeezy I and by drawing inspiration from previous Nike trainers. Of course, it wouldn’t be a Kanye West design without having some form of his own style in the mix. Most prominently is the aggressively molded rear and the snake skin detail on the quarters is simply breathtaking. The shoe released in three different colorways: Platinum, Solar Red, and in the infamous Red October color way. While the Platinum and Solar Red released as scheduled, the Red Octobers were the most sought after and demanded pair of Yeezys. 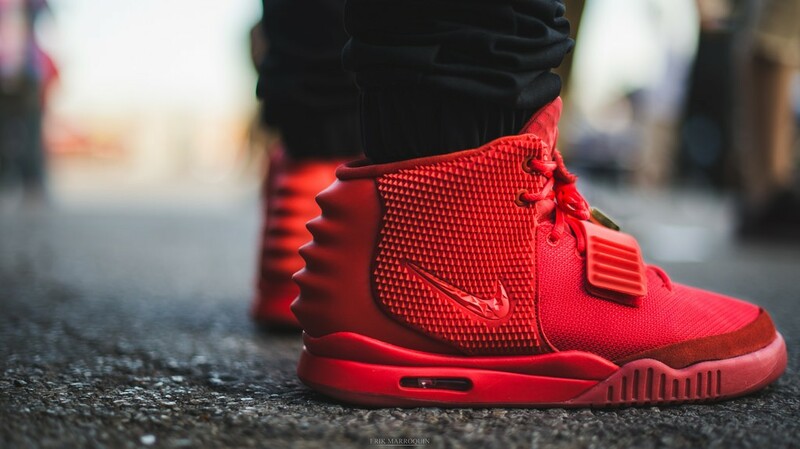 In fact, till this day the Red Octobers are pretty much one of the most coveted sneakers of all time, they resell for an average $5,000 USD (which is about a 2000% mark up from their $245 USD retail). All three are without a doubt worth the hype! And anyone who says otherwise needs to freshen up on their sneaker history. This is the first silhouette to sport the Yeezy name after Ye’ departed from the swoosh to partner up with their arch nemesis, adidas. In fact, anticipation grew heavily when their partnership was officially revealed. 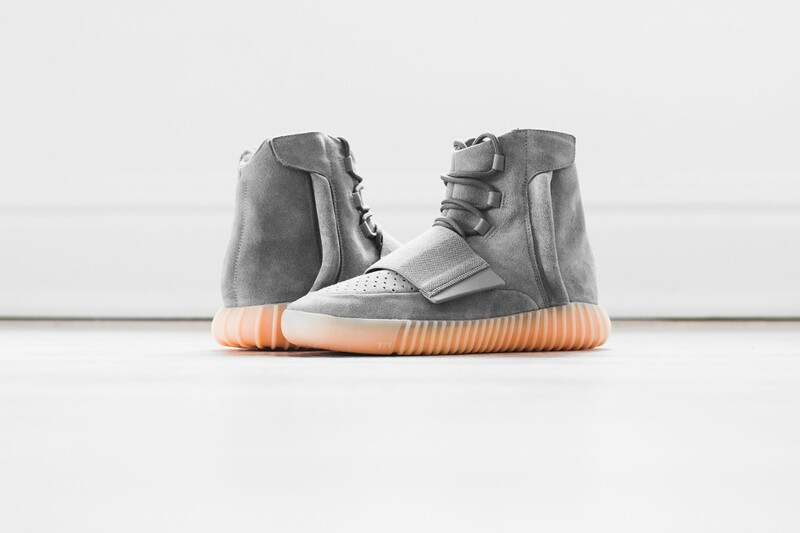 The Yeezy Boost 750s’ are a homage to Kanye’s creativity. Especially given the fact that many speculate that the reason for Kanye’s departure was due to the lack of creative freedom. Furthermore, the suede-based upper lays on top of a full Boost sole. You’ll also find a zipper on the model’s lateral side as well as a strap along both mid-foots. While the hype was huge for all three colorways (e.g. all black, Light grey with glow in the dark gum, and in a light grey) of this Yeezy silhouette (due to being the first official adidas x Kanye West “Yeezy”), the hype for this show is not worth it. In comparison to the Air Yeezy II the Yeezy Boost 750, it falls a bit short to its Nike counterpart. Hype tends to outweigh quality a lot of times. This one isn’t a victim of those circumstances. The adidas Yeezy Boost 350 may be the most popular silhouette among the adidas x Kanye West designs. Unveiled last summer at NYFW, the low top sneaker sports a one piece primeknit upper that rests firmly on top of the Boost cushioned sole. This silhouette has already been released in a few distinct colorways: Turtle Dove, Pirate Black, Moonrock, and Oxford Tan. And there seems to be no stopping Kanye any time soon with many different colorways and new takes on the 350s already in the woodworks. For a mere $200 USD, these shoes are definitely worth the hype, but we all just need to be able to buy a pair (at retail price). While Mr. West may be the reason that the three stripes’ shares and sales have risen in the last couple of months, the Yeezy 950’s have only been a small fraction of that positive stride. 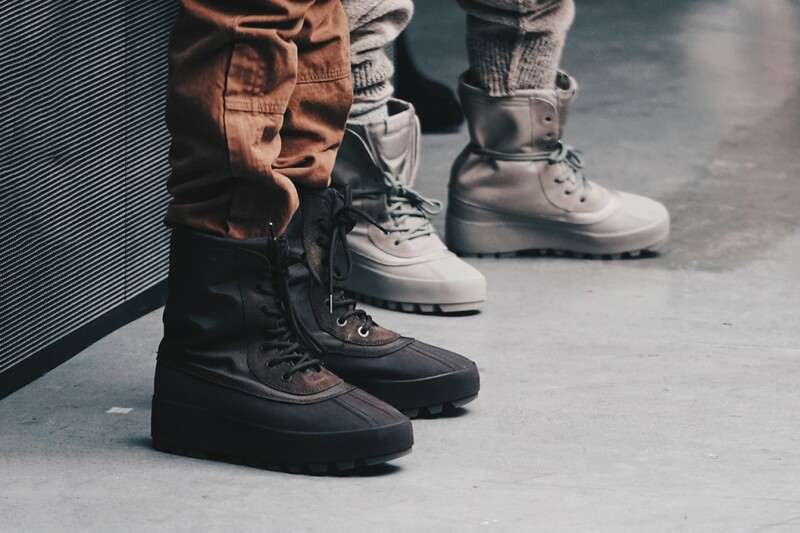 Part of the footwear series of Kanye West’s inaugural collaboration with adidas, the Yeezy 950 Duckboot strayed away from the sneaker silhouette of the previous 350 and 750 models and took inspiration from the military to create Kanye’s first duckboot. Of course, this silhouette has held the smallest impact. The resell value of these is almost non existent and these have been the most expensive Yeezys fabricated by adidas till this day (coming in at a whopping $585 USD). To be quite frank, they are not worth the hype, or the lavish price tag. Lastly, we have the most recent edition to the Yeezy arsenal: the crepe-soled boot. The duck-boot inspired silhouette is a more refined version than previous iterations (most notably the Yeezy 950 Duckboot). The upper is made of 100% premium suede with a rubber crepe sole, like classic desert boots. The boots are made in Spain and are part of the YEEZY lineup; however, this silhouette holds no connection to adidas whatsoever. The Season 2 Crepe-soled Boot, unlike all the other Yeezy releases, can still be found for sale floating around the Internet. 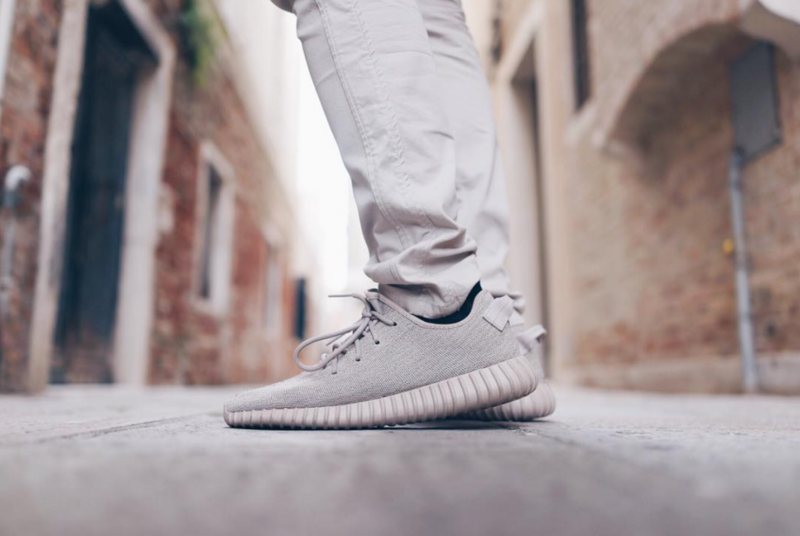 Currently, they have only been released in both the taupe and oil colorways. Even though these boots have the decorum of having the Yeezy name embellished on them, they do not meet the Yeezy-standard. These boots, similar to the 950’s, are not worth the hype. Kanye needs to step it up when it comes to designing boots if he hopes to continue the same level of buzz that all his shoes have triggered. Love them or hate them, there is no denying the influence that Yeezys have had in the last decade. Whether you’re a devoted sneaker-head or just in it for financial motives, we can all stand in agreement that most Yeezys are worth the hype, with some minimal exceptions. Which pair of Yeezy’s is your favorite? Do you agree with our selections? Do you think they are worth the hype? Let me know in the comments below.